UPDATED: Jamo launches £300 surround system and add-on subwoofer | What Hi-Fi? 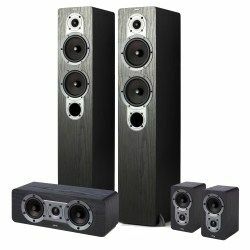 Jamo has announced a new surround sound speaker package for the budget market, the S 426HCS3. Weighing in at just £300, the five-channel package has floorstanding front speakers, bookshelf rears and a dedicated centre and subwoofer. Delivered in a black ash finish in the UK, the floorstanders stand 91cm tall and boast dual 5.5in woofers together with a 1in soft dome tweeter. The rear satellites, 20cm tall, and centre channel come supplied with wall brackets. The Jamo S 426HC3 speaker package has a suggested retail price of just £300, with the SUB260 subwoofer available in matching black ash as an option for a further £300. The subwoofer uses a 20cm driver and an amplifier capable of 260W peak power in an enclosure with a slotted port, allowing bass extension down to 30Hz. The drive unit has a high-rigidity composite cone and a motor with a well-ventilated poie piece, allowing long excursions without distortion and increased power handling. The sub has stereo line inputs and auto-sensing power switching. Both the speaker package and the subwoofer are available online and from Jamo retailers across the UK.